Ever feel like there is something different about you? Feel like there is an invisible wall that separates you from everyone else? Don't fit in? 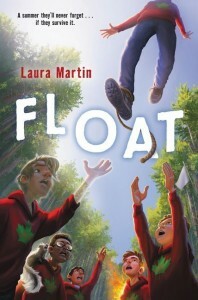 A question for you.... can you float? Do parts of you simply disappear into thin air while you're having a conversation? Do you ever turn into a dog...albeit a cute and cuddly dog? Stuck to any trees lately? Welcome to Camp Outlier or as the kids call it, Camp Outsider. As 12 year old Emerson and his nervous mother drive up to drop him off for a summer of camp, a black SUV with tinted windows appears driven by a guy with a "don't mess with you or I'll kill you" look on his face. What the heck? Emerson is about to meet his fellow inmates of the Red Maple Cabin and he's about to find out this isn't ordinary summer camp. Emerson is a RISK kid, a Reoccurring Incident of the Strange Kind kid and he's a level five RISK kid. He floats. His mom has him protected by a weighted vest and shoes and she's included the contact phone number for NASA in case he rises into their territory. Emerson is used to it all. It's part of his life. Well, it's part of his life until his cabin mate, Hank, throws Emerson's weighted shoes into the lake. Emerson is about to find out he has arrived at a place where he fits in. The other guys in his cabin include Anthony who sets things on fire by touching them, Zeke with randomly occurring X-Ray vision, a skunk, and then there's Hank. Hank is the guy whose body parts disappear at times. If he isn't wearing clothes, he can actually be fully invisible and no one knows he's there. Trouble with that is sometimes he reappears when he isn't expecting it and the campers at Camp Outlier are going to get to see more of Hank than they ever wanted to. Murphy is a time traveler. He goes to the future. He's the one the black SUV was there to deliver. Murphy is a government asset and they guard him closely. As they guys in the Red Maple Cabin get to know him more, they find out this will probably be Murphy's last summer. It will be his last days. Murphy knows he won't live beyond summer's end. Scrappy, spunky, unique, hilarious...the guys in the Red Maple Cabin are about to have the time of their lives as their ring leader, Hank, takes them into girl territory and wakes them up to the fact that life is fun and there is no time like now to start having some. One of my favorite fun reads this summer.